Ed Smith, of Letart, is pictured as he points out the different bees that inhibit one of his 15 hives. Smith and wife, Betsy, have been enjoying beekeeping and honey collection for the past three years. 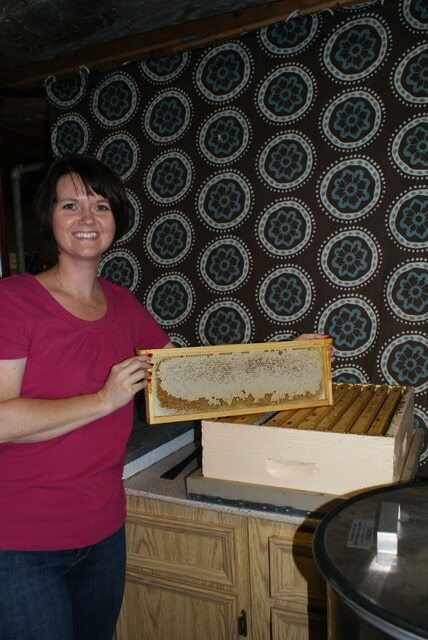 Betsy Smith displays a frame of honey that is ready to be extracted at her home in Letart. Betsy and her husband, Ed, expect to have about 275 pounds or more of the sweet stuff this year. The couple said they enjoy their hobby and added it is something they can do together. LETART — When Betsy Smith gives her husband, Ed, a “honey do” job, she literally means it. The young Letart couple has found pleasure in the unique hobby of beekeeping and honey collection. Now in their third year, the Smiths expect to extract about 200 pounds of the sweet stuff in the next few weeks. Ed said he first became interested in the hobby when he and Betsy lived in Leon. He heard that the honey bees were endangered, and after seeing some beekeepers at the Milton Pumpkin Festival, he decided to give it a try. Ed attended his first meeting at the Jackson County (W.Va.) Bee Club and was hooked. Starting out with a couple of hives, he went to eight by last fall. Three of those were lost over the winter, but he added more this year and now has 15. While Betsy leaves most of the beekeeping duties to Ed, when it comes time to extract the honey, she is right by his side. The Smiths have the honey equipment in their basement. Once the honeycomb is ready and capped off by the bees, the frames are taken to the basement and placed, two at a time, in the extractor. The Smiths have a hand-cranked version, so Betsy said a lot of work goes into cranking to remove the honey. It then goes through filters and is allowed to sit for 24 hours to get the air bubbles out before it is bottled. While some beekeepers opt to mix all their honey together before bottling, the Smiths choose to bottle theirs as it is collected. They have a dark (almost black) honey, made from the nectar of knotweed; an amber honey from clover; and an almost clear honey from locust. Betsy, along with her two nieces and nephew, are also known for their decorative hives. Many of them are painted with colorful flowers. Bees are interesting creatures, according to the Smiths. There are up to 80,000 bees in a hive, but only one queen. The queen bee lays between 1,500 and 2,000 eggs per day at this time of year. There are three different bees in each hive: the queen; the drone, which is a male and dies after mating; and the worker bee, which is a female. A queen bee can live three to five years, while a worker bee lives six weeks — three inside the hive and three outside. According to Ed, worker bees literally work themselves to death. Bees also take very good care of their queen. While many bees freeze to death in the hives during winter, it always remains an even 97 degrees where the queen is located. Beekeeping can be an expensive hobby. The Smiths estimate they have $4,000 invested in the hives, bees and honey equipment. One of Ed’s recent purchases was two queen bees, which were flown in from California. They arrived in two small cages along with three or four worker bees. Candy fondant plugged the entrance to the cages, which the bees ate while in transit. The first year of a hive, bees work to build the comb. Last year, Betsy said they gathered about 35 pounds of honey, enough for themselves, as well as family. This year the couple has extracted 75 pounds of honey so far, with another 200 pounds coming in the next few weeks. It will be the first year the Smiths will be selling honey to the public. Raw honey is said to have health benefits, and is believed to be good for allergies because it comes from the nectar of local plants. Raw honey is not heated before bottling like the honey purchased in stores. This winter, Betsy is looking forward to some projects using the beeswax. Ed has build a solar box to melt the wax, and Betsy will be dabbling in making lotions, lip balms and soaps. The Smiths are very protective of their bees, and bees in general. Bees pollinate many different crops. They encourage people not to kill the clover and dandelions in their yards, and if possible, allow fields or small sections of yard to grow for a few weeks before mowing. The couple said it is also beneficial to bees if people plant flowers in clusters instead of rows or far apart. Mowing in early morning or late evening prevents many bees from being killed. When not spending their time among the bees, Ed is employed at M&G Polymers in Apple Grove. Betsy works from home in medical coding. They can be reached by calling 304-895-3430.